I actually thought it was menitoned in this thread, but using different fora, sometimes you overlook where you saw the info. One's eyes glaze over after a point! I've seen many references to the pigtail version with male connector but not the female with latch. Now I can make a dandy extension cord. Do you think the cord needs to of the shielded type? The reason I ask is that the original cables that come with the FL Tester are shielded. On a side note, I have 4 original cables, 3 do not use the middle pin of the 3-pin connector, while 1 has it connected to pin 8 of the 9-pin sub D. How are yours? pinino wrote: One's eyes glaze over after a point! I've seen many references to the pigtail version with male connector but not the female with latch. Now I can make a dandy extension cord. Do you think the cord needs to of the shielded type? The reason I ask is that the original cables that come with the FL Tester are shielded. On a side note, I have 4 original cables, 3 do not use the middle pin of the 3-pin connector, while 1 has it connected to pin 8 of the 9-pin sub D. How are yours? That's a good question, if needed or not. I haven't looked that specifically at the cables, but will do so in the next couple of days and get back to you. I have also bought another Marelli tester, which I should get next week. I don't know how many cables will come with that, but will also look at that. ... I forgot to say that I fabricated a set of cables using non-shielded wire and they seem to work fine. I imagine that the original cables are a bit overkill. In the tester side with the 3 pin plug, the black wire is cut, but I have no problem using it. I can see that the 3 wires are shielded in the surrounding cable. I will look at the cable(s) in the tester I will get next week. From what I can see, the wires going to the units in the car are not shielded. I have tried to connect to the ABS and Motronic-ECU but they don't seem to respond. * Clicks connect and the Yellow light starts flashing but the Green light turns off. * The program status shows Connecting ECU but nothing happens.. I guess that the green light should stay on all the time but it doesn't.. I have also tried the Multiecuscan program but it just says "ECU not responding" after trying to connect for a while..
Maffia_Alfista wrote: I have tried to connect to the ABS and Motronic-ECU but they don't seem to respond. That should give you a green light and connection, possibly with the yellow light flashing some times. You could also try the airbag to see if that works. That is to the right side of the glovebox behind the plastic trim. Yeah that's what I have tried. Light on the connector is on. Green and Red lights in program on but turns off then I try to connect and the yellow light starts flashing. Maffia_Alfista wrote: Yeah that's what I have tried. The .ini drive install file didn't work at first but when I connected the VAG-COM Windows found new USB-hardware and I chose to search for drives in the folder where I had put the Wilco-drivefiles. Windows installed 2 drives and after that the diagnostics program found the VAG-COM and was able to connect through Port 1.
well.. the yellow light shows the connection request. The red lights on sending data. So it might the ecu is not responding. Also set the buffers and responsetime for the port as low as possible. Thanks for making and sharing this excellent program with all of us!! I be able to connect perfectly with the Engine ECU and ABS of my 1997 24v, but I have one cuestion (it is very stupid, but it is driving me really crazy). How many cables are supposed to have the 3 pin test connector for a Siemens Airbag Module? I found it near to the glovebox, but it only have 2 cables on it (White/red and black) but I suppose it must have 3 cables on it, like the ones of the ecu and ABS. Is it right? What colours are they? I am trying to turn off my annoying airbag light that show up a few days ago Thanks in advance!! Many thanks for your program, I have had several issues with the running of my Q4, with rough idle when hot to non starting when cold. This week spent two hours trying to start the car, succeeded and then she would not start again. I plugged in your software and a RPM sensor was the fault code displayed. I replaced this and bingo she started first time and has run the smoothest ever since I bought her. ppg wrote: Thanks for making and sharing this excellent program with all of us!! 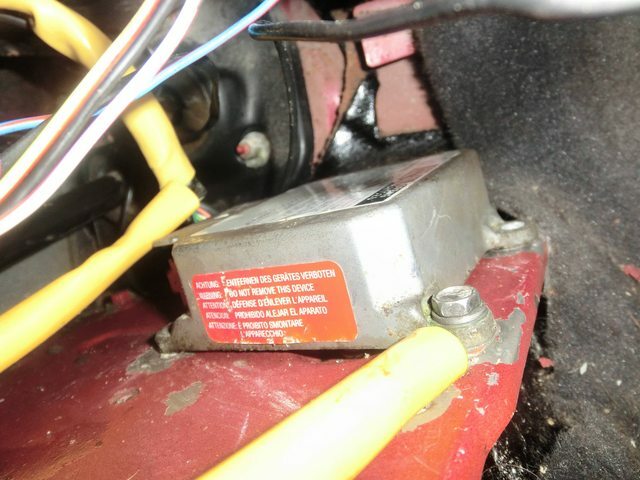 If it has never been touched before, the airbagconnector is located behind the trimpanel right of the glovecompartment.The trimpanel has only one screw and slides down after the screw is loose. Behind the panel you will find the righthand connectorfield which connects the dashboard to the rest of the car. The connectors are on a kind of sled. You can pull the sled out and if you look around with a flashlight you will see your 3 pin ABS connector. Disregard the circle, that circle was for another topic. This is the area where the ABS connector should be located. Thank you for your response 164TD! I sadly guess the connector has been touched before, but the airbag light worked fine until a couple of days ago. 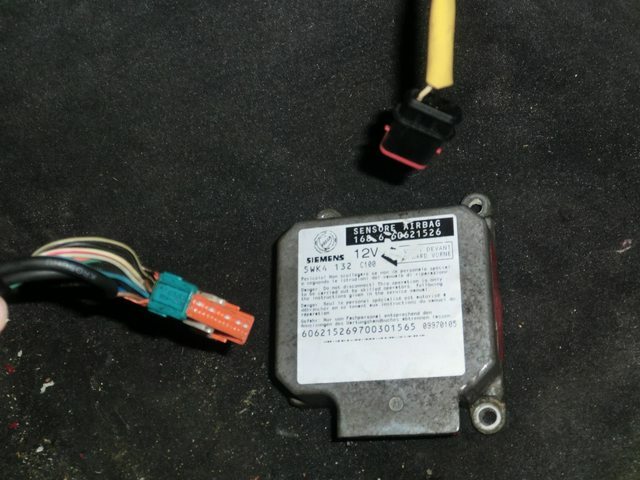 I send you a few pictures of the connector (that as you can see has only 2 cables on it), and the airbag module. 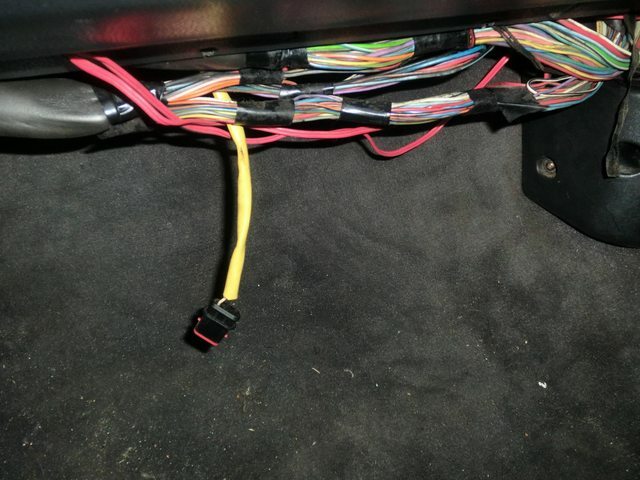 I saw all the connectors diagrams in the manual section of the forum (very helpful by the way) and the airbag should have 3 cables on it (White red, black and light blue White), but mine has only 2 I suppose that´s the reason because I can´t communicate with the Ecu, but I didn´t find any loose cable. This version is the latest one, with double airbag, maybe that´s the reason of this difference, can it be possible? The diagnostic connector indeed only has 2 pins.black is ground; diagnostic K an L line go over the other wire. I cannot find it instanly but Wilco solved this mistery by using another program of another Airbagsystem. Use the searchfuntion on the forum for it. the new type airbag is the allied signal airbag. at some point i will also integrate this one into the program and i did start it, but due to lack of time.. i just didn't finish it.. This one is able to reset the newer type airbag. the red light is sent data to the car. Does it get the serial number of the ECU? If yes, do both the red and green flicker for some time ? the question about shielded or not. The speed of the protocol is only 4800 baud. which is pretty slow. I have seen original testers with 3 meters unshielded wire so i guess it should go just fine. Thanks 164TD and Wilco, you guys are awesome! I downloaded the MultiEcuScan and now I can communicate with the Airbag Ecu using the Allied Signal 1F. Then I got two error codes: 02 - Battery Voltage too low and 10 - Passenger's squib in S.C. When I cleared the error codes, the second one only appears after a while again. Do you know if there is a connector that I can check? Thanks again for your help!!! Thanks 164TD!! Have a good holiday! the airbag ecu is in the mid console close to the engine ecu. I have a USB VAGKKL+FIATECUSCAN cable with a switch to switch between pins 7,3,1/9,12/13 and a additional 3pin converter with two clamps for the power supply. Will that one work? I was unable to connect to the ECU with MultiEcuScan and have read that that software does not support my car. It's a 164 3.0 V6 24v Super 1995. Is there maybe a video on how somebody set up the connection with Alfa164Diagnostics? Did the cable come with a CD; on the CD you will have the drivers.